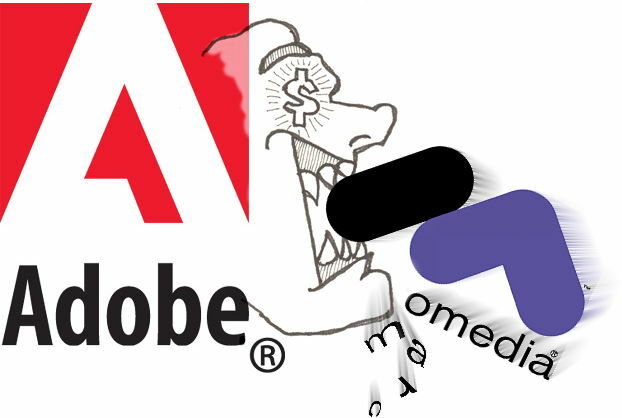 This image is an illustration for a blog post about Adobe's purchase of Macromedia in 2005. I wasn't particularly a fan of the merger. Macromedia was a very innovative company, and this is why their software gained Adobe's attention. Thankfully Adobe wasted far too much money on the takeover, and they will likely never get the full return on the investment. Flash and Dreamweaver are the most popular former Macromedia products. Flash is on it's way out of the web market, and Dreamweaver isn't a huge player anymore either. I never liked either, though some of my earliest web projects made use of Dreamweaver. Fireworks is my favorite Macromedia product, and I still use an old version of it occasionally. Though I don't hate Adobe entirely, and their products are generally good, I don't find any Adobe product indispensable. It is very unlikely I will ever buy a Creative Cloud subscription. Free, open source and cheap alternatives exist which eclipse any perceived need for Adobe products. The Adobe money monger head was sketched by pencil and scanned in. Everything else was put together in Macromedia Fireworks, a version prior to the Adobe takeover of course - MX 2004.